Burn them alive: A representation of the medieval perception of witches as malevolent, devilish forces. 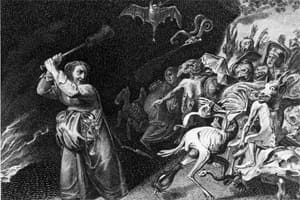 The persecution of alleged witches in medieval Europe is one of those historical barbarities that popular culture has somehow turned into a subject proper for comedy. Recall the memorable sequence in Monty Python And the Holy Grail where Sir Bedevere asks the mob baying for a young woman to be burnt, “What makes you think she’s a witch?" “Well, she turned me into a newt!" says a peasant. “A newt?" A long pause. “I got better." “Burn her anyway!" cries the crowd. ‘She bewitched John Law!’ said Hargreaves. The men did not reply." Quietly, in the course of a single page of prose, Winterson makes it clear what sort of book we have on our hands. Not the festival of gore—male cruelty punished with female violence—promised us early on but something more richly textured. Winterson does not use her witches as mere archetypes in some parable about McCarthyism. Her story is drawn from history, the Pendle trials of 1612 when nine women and two men were hanged for witchcraft, an event thoroughly documented by the clerk to the court Thomas Potts in his The Wonderfull Discoverie of Witches in the Countie of Lancaster (1613). Winterson supplements Potts’ account, when it is found wanting in detail or coherence, with the products of some riotous speculation: There is a fervid sapphic romance, a cameo from Shakespeare, and two from Satan himself. It is hard to offer much more in the way of plot summary for so short a book without depriving the reader of its special pleasures. The Daylight Gate: Hammer/Random House UK, 208 pages, £9.99 (around ₹ 880). ‘They are both diabolical,’ said Potts. ‘Treasonable and diabolical. ...’"
Catholicism survived the trials of the Reformation; witchcraft did not. Yet there once was a king who thought them equally subversive. The Catholics were allowed their voice eventually, though the Roman Catholic Relief Act would not come until 1829. The witches have had to wait longer. Campaigners petitioned the Scottish parliament a few years ago for a full pardon of the Pendle witches. Winterson’s readers will likely see the justice of the cause, for all the apparent eccentricity of the petition. Recompense for history’s defeated will as soon come from an act of the fantastical imagination as from an act of parliament.